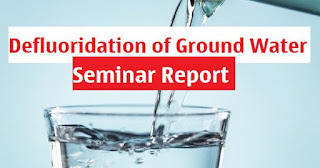 Civil Engineering Seminar topic: Defluoridation of Ground Water. Groundwater is an important source of drinking water. More than 200 million people worldwide majority from the developing world are drinking groundwater with fluoride concentrations greater than the WHO guideline value of 1.5mg/l. Here we have uploaded various approaches of defluoridation of groundwater. Fluoride is one of the very few chemicals that have shown to cause significant effects in people through drinking water. Ground waters are much more vulnerable to fluoride enrichment than surface waters because of the greater impacts of water-rock reactions in aquifers. There are many adverse effects of fluoride on human health such as Skeletal fluorosis, Dental fluorosis, Risk of fractures in bones, Immune deficiency and may leads to Cancer. Here, we will focus on two approaches which will help the civil engineering students to prepare the seminar report. The first paper for seminar report discussed the process of Defluoridation of groundwater using corn cobs powder as a natural adsorbent using a fabricated filter. The results show that the filtration with corn cobs powder reduces the fluoride content for the samples. The second paper for seminar report discussed the experimental investigation to develop a cheaper and safer method of defluoridation. The adsorbents used in this investigation are amla powder, coconut shell powder, neem powder, and turmeric powder. All adsorbents used are inexpensive and nontoxic materials, available easily in nature and locally at village/rural level.